A book about private collections was just published in Russia with a chapter on the Raskin collection. The text is in Russian. The title is translated as "Passions of an Antiquarian"
The chapter "Many Faces of Masks form the Raskin Collection" is authored by Vera Raskin and has 21 photos of our items. 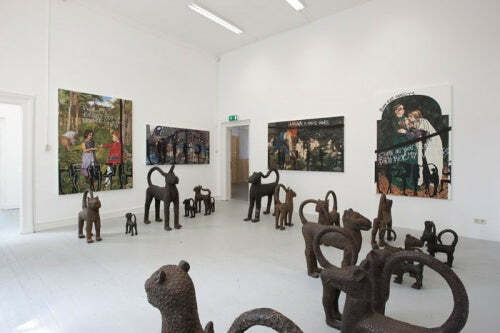 Bronze leopards from our collection made a big splash as a part of a solo project by the Norwegian artist Bjarne Melgaard/Rod Bianco "Super Normal" in Amsterdam. 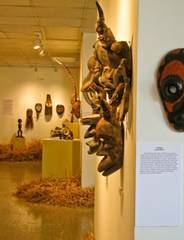 A Pende Mask purchased from our website was featured with masks from the collection of William H, Gotwald, PhD. 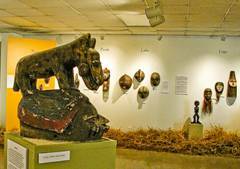 The role of our Dogon piece? A decorative one! First of the 13 episodes premiered on August 16th. 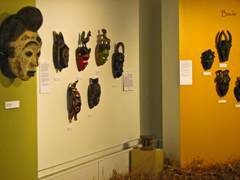 Five masks from our Museum site www.zyama.com made a delightful cameo appearance in a new documentary film "Gateways to Faerie." You may be familiar with creations of John Curtis Crawford, the artist whose faerie houses are the subject of this film. Throughout his artistic career, John created, built and manipulated various creatures, dinosaurs, and aliens, as well as fanciful characters for Jim Henson's Muppets. His work has won numerous awards including one from the Cannes Film Festival for Special Effects.